Coming home from the hangar in Camarillo, as I topped the Camarillo Grade on the 101 and started down into Thousand Oaks, it was immediately clear that something was amiss. From a good twenty miles away, a column of smoke was visible, the brown, roiling, wannabe pyrocumulus. Right in my path. I couldn’t find anything on the news, although they were talking about several other brush fires in the area that were being attacked. Thirty acres here, something being held to twenty acres there, all “normal” for Southern California in the first weekend where it’s topping 100° every day for three or four days. The question was, “Where? Where exactly?” Down in Malibu? Off of Topanga Canyon? Up north of the 101 by our place? Getting off the freeway at my normal exit was, in retrospect, a mistake. 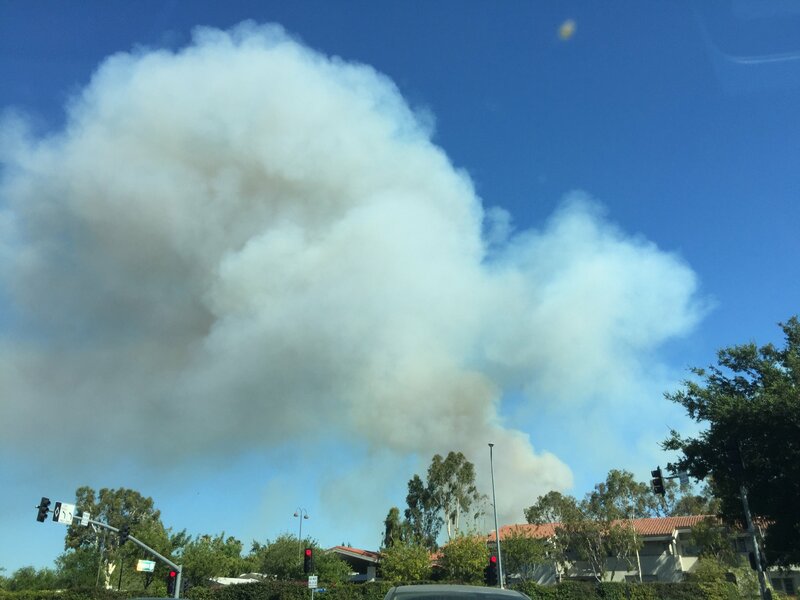 It turns out the fire is in Calabasas, only a mile or so from that exit, and traffic was (after it was too late to wave off and stay on the freeway) gridlocked. So, no, it wasn’t dangerous taking these pictures while behind the steering wheel. We weren’t moving. At least this wasn’t THAT close to us. 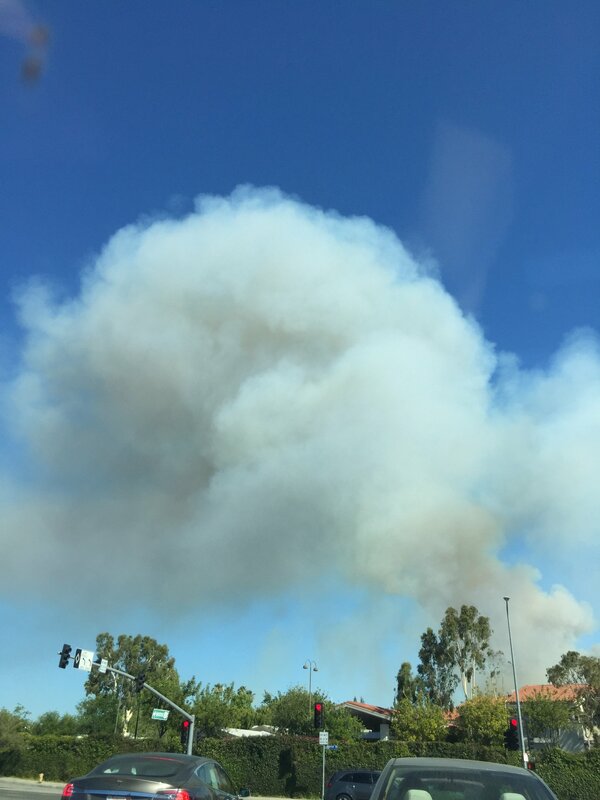 While my car dashboard was saying it was 102° outside, there wasn’t a lot of wind, which can be the factor that turns a twenty-acre brush fire into a twenty thousand acre brush fire. I was patient and was finally able to turn onto Valley Circle (a left then another left to head back to the north) at which point it almost immediately got worse. Two things. First, there was a second brush fire. Much smaller, but much closer to our house and much, much closer to a lot of homes. (For family and those who have visited, it’s west of Valley Circle behind the baseball fields, sort of in that canyon between the fields and Victory Boulevard.) There were helicopters dropping water all over it so I don’t think it will have a chance to grow much. I hope. But secondly, there had been a major car accident with were apparently a lot of cars and a lot of injuries. Valley Circle Drive, the last of the major north-south streets at the west end of the San Fernando Valley, was closed. Completely. With all of that traffic trying to squeeze off into one tiny residential side street. Take hundreds, if not thousands, of impatient, pissed-off, Los Angeles drivers, 99.9% of whom have never in their lives been off of a main street unless they were within a half-mile of their house, and shove them off onto a gridlocked, narrow, residential side street with no traffic control and no clue for them about how to get around the problem and back to where they want to be. Yeah, it was that much fun. I knew exactly where I wanted to go. I’ve run and walked all of these streets when I’ve been training for marathons. (Taking the same routes over and over is really boring – I try to explore a bit.) It was the other 999 drivers (or it might have been 666 of them) that were in my way. Meanwhile, when I finally did get to where I wanted to go, i.e., the next through north-south route, I found it to be gridlocked by people diverted off of Valley Circle coming from the north. I did consider finding a spot to legally park without causing any further gridlock and just walking the three miles or so home. But, 102° convinced me otherwise. I finally broke free of the gridlock, looped around all of the traffic, came in from the other side, and made it home, even if I didn’t pass a gas station on that route. Tomorrow I may run out of gas a hundred yards from the house, but for now I am home. There is a steady stream of helicopters going overhead, one every sixty seconds or so. It looks like they’re refilling their tanks from the Chatsworth Reservoir (about a mile north of here) and shuttling back and forth to the smaller but much closer fire behind the baseball fields, and to the big Calabasas fire that (according to the ongoing news reports) is completely out of control and growing. It looks like an awful lot of $1M+ homes didn’t do their brush clearance and may pay the price. I’m going to go get a cold drink, find a shady spot outside, watch the helicopters, monitor the news, and maybe review and update my Bugout Lists. Worry not, it’s close, but I don’t think it’s THAT close. Talking of gridlock, we had that in the multi-storey carpark last night at 11.30 pm. The road to the football stadium where most of us had been to see Rod Stewart was solid, so no right turn out of the exit. Dimbos stayed there, waiting to turn right, so NOBODY could get out. Finally exited the car park at 1 am. PS of course, we drive on the correct side of the road 😉 so switch left and right to get the correct effect!